Book your online reservation directly with top hotels in Prague Czech Republic - from two star, economy, child & family friendly lodging, first class accommodations to superior hoteles, deluxe luxury hotels and resorts. Find downtown Prague hotels, midtown, business district or airport hotels using our search engine, and find the best hotels in the Prague area for your next family vacation, romantic weekend getaways, holiday, or business trip. First class: the location of the K+K Hotel Central in Prague's Old Town - just a few steps away from the Powder Tower - demonstrates that the 4-star superior K+K Hotel Central is indeed a very central starting point for visitors to Prague, no matter what you wish to see and do - just as its name promises. Those travelling to Prague on business have found their conference hotel with K+K - our hotel in Prague features state-of-the-art conference rooms and a business lounge. Explore Prague's Old Town and the many sights, museums, restaurants and shops easily by foot from your holiday home-away-from-home: the K+K Hotel Central in the city centre of Prague. In the heart of the 'Golden City' - just a few steps away from Wenceslas Square - the gates of the K+K Hotel Fenix reveal a lively, cheerful hotel in Prague's centre. The remarkable architecture of the facade in 'Prague modern' style embraces a stylish hotel with a fresh and exclusive ambiance. By way of its central and yet peaceful location in the centre of Prague, the K+K Hotel Fenix is the ideal hotel accommodation in Prague for both business and pleasure. Conveniently located in Prague’s city centre is Hotel UNIC Prague – a four-star hotel as unique as the city it calls home. Guests first notice the vibrant blend of contemporary and classic décor. From the walls adorned with Spanish paintings to the modern furnishings, the design is an effortless portrayal of the city’s identity. The array of elegant rooms and suites, the local and international flavours at Restaurant & Bar Aliter, the caring 24/7 reception staff – it’s all designed to create the most pristine and enjoyable Prague experience possible. Welcome to Hotel UNIC Prague. Experience the new atmosphere of one of the best rated design hotels in Prague. The four star hotel Yasmin offers high standard hospitality services ready to pamper our guests and the staff will make your stay as comfortable and convenient as possible.Thanks to the hotel's location expose yourself to a Prague's history and glamour right outside the door. Discover the world's specialities thanks to our chef's creativity and experience in the great hotel restaurant-Noodles. We offer accommodation for all your needs, with features such as FREE WiFi internet access, adjustable air-condition, minibar, safety deposit box and luxurious bathrooms. For relaxation of your mind and body, you can visit our health club and sauna facilities. A beautiful historical square, a remarkable frescoed building, elegant stylish interiors with UpToDate amenities, impeccable restaurant and services - attributes that make Hotel Rott one of the best places for your stay in Prague. Located so ideally that you can cover and enjoy the whole city center just walking, hotel Rott perfectly combines old values and modern amenities. It is a place where the authenticity of historical Prague is not just a vain notion. An ideal venue for your first or repeated visit to the charming city of Prague. Hotel Paris has a superb location in the hub of the historic centre of Prague, next to the Municipal House and Powder Tower, the medieval entrance gate to the city. Most of the city's other historic sites are within easy walking distance, including the Old Town, Jewish Quarter, Charles Bridge and Wenceslas Square; all of which you will find on any city centre Prague map. You will also find some of the finest designer boutiques and other elegant stores in the streets surrounding Hotel Paris. This beautiful, elegant, intimate and characterful hotel has an ideal location in one of the quietest areas of central Prague, just a short stroll from the Old Town Square and within easy walking distance of Wenceslas Square, Charles Bridge and Prague's bustling business and shopping centres. Prague hotel Courtyard Prague Flora, located in the chic Vinohrady district, right in the city centre. 2 metro stations away from Wenceslas square. Offers upscale spacious guest rooms, high-speed Internet, meeting space, fitness, dining & on-site parking. Famous for service, friendliness and efficiency with a smile, the Grand Hotel Bohemia combines modern appointments with the irresistible charm of Old Prague. Ideally located in the very heart of the Old Town, it is the first choice for the discerning leisure or business traveller. It offers 78 newly renovated rooms with modern fittings and a luxury design. The dark wooden furniture in combination with light and bright colours creates an impression of airiness and elegance, accompanied by the most up-to-date equipment ; LCD television, broadband Internet, a mini bar, trouser press, personal safe and luxuriously fitted bathrooms. 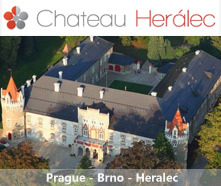 It boasts an excellent restaurant, bar and a unique neo-baroque ballroom. A member of the Worldhotels First Class Collection, its faultless service, friendly atmosphere and excellent business amenities have made the Grand Hotel Bohemia famous for more than eight decades. Grand Hotel Bohemia is the ideal place to stay for the most demanding of guests. Whether you are traveling for business or leisure, the wonderful ambience, first-class service and superb facilities of the luxurious Kempinski Hotel Hybernska guarantee you an exceptional stay in Prague. The new and luxurious Kempinski Hotel Hybernska Prague offers a wonderful combination of historical architecture and a contemporary interior. Ensconce yourself in one of the hotel's stunning guestrooms, relax on its private balcony, and admire the beautiful views and sounds of magical Prague. Hotel Grand Majestic Plaza is located in one of the most desirable areas in the historical centre of Prague, just a few steps from the famous Municipal House, Gothic Poder Gate, the Republic Square and the Palladium shopping centre. Featuring stunning contemporary design, the four-star Grand Majestic Plaza offers 196 design rooms including six luxury apartments. The light-filled foyer features a colourful, dramatic water fountain. Rooms are stylishly decorated in a contemporary style, featuring sleek lines, warm colours and natural tones. Bathrooms boast luxurious natural stone finish with high-quality amenities. The Hotel Grand Majestic Plaza provides four conference rooms, all flooded with natural daylight. With its excellent service, a wide variety of cuisine options and a welcoming atmosphere, the Grand Majestic Plaza is a hotel of the WORLDHOTELS First Class collection. Whether your stay in Prague is for business or leisure, the friendly, professional staff at the Hotel Grand Majestic Plaza will ensure that your stay is as enjoyable and memorable as possible. Accommodation in 5 star hotel in Prague, located right in the Prague's center in the pedestrian area on famous Wenceslas Square . Hotel provides accommodation in tastefully furnished rooms. The Hotel Ambassador – The Golden Goose is ideal for individuals, groups or executives . The hotel’s services always meet the highest expectations of its guests. With its Thai & Wellness Club, the hotel provides its guests with a unique combination of relaxation and tranquility while they admire the historic monuments in the centre of Prague. Hotel Ambassador offers a distinctive conference centre with exclusive catering facilities at an international level.